First, better than reading this blog post, read the story. The overall result was that very few people stopped to listen. Only one person, near the end of the hour-long per:formance, recognized Joshua Bell. Bell got about $40 in contributions. First Reaction. I thought of the Joni Mitchell song “He was playiing real good for free”. The story of itinerant musicians, and their relation to musical stars. I live in New York, and I’ve been appreciative of the variety of terrific arts and music, not all expensive. I’m not in the art world, but I love the fact that it goes on in parallel with my life. I know some artists: musicians, actors, painters, movie-makers. Their worlds can be wonderful; they expand the world we share. Second reaction: Joshua Bell is a menche. I especially liked that he didn’t want to be called a genius. Not false modesty. I think he got it right. Third reaction: Joshua Bell’s description of what he’s thinking about when he is playing. He described it like a performance juggler, who is beyond the mechanics of juggling, and can talk with the audience during performance. In Bell’s mind, during performance, he has to think of interpretation and meaning. Technique has to be over-trained and largely automatic. I think we all know this, but its got to be emphasized. I wrote a blog post in expert athletic performance, focused on the same point. A great athlete must be thinking about the highest level, strategy or reading key reactions of the defenders, and cannot be thinking about rudimentary technique. Conscious decision rate is very slow; perhaps one decision per second. Far too slow for a muscician or an athlete. Side note. I used to juggle, and I was pretty good. Juggling became extremely automatic. I felt I could do it with eyes close. When I closed eyes, balls fell. This says I was doing a fantastic amount of visual processing, but it required no conscious supervision. Fourth Reaction: What does this say about art? Beauty? Aesthetics? I’ve been thinking a lot about aesthetics and qualia. Roughly, I think great art does two things: 1. It elicits an inner feeling of pleasure, a quale, linked to the sensory experience; and 2. It does this by building on a learned cultural context, a relation to prior art, to technique, and sometimes, to representation. In other words, great art brings joy and insight. In addition, the depth of the perception of art is related to the depth of understanding the artform. Fifth Reaction: The individual stories are what makes the heart of the action. Each has unique perspective: Joshua Bell, the one-time violinist, the one woman who recognized Bell and the shoe-shine lady. What I DON’T think the article is about. After writing most of this post I googled Weingarten and Joshua Bell and subway and found that this piece is quite famous. Weingarten won the 2008 pulitzer prize for it in the “feature writing” category. There are numerous reviews and comments about the piece. Virtually all of them say that the theme is “don’t live life too fast” or “stop and smell the roses”. Amazon’s summary is that it is “a lesson about life lived too quickly”. This was a starting point, but not a major theme. 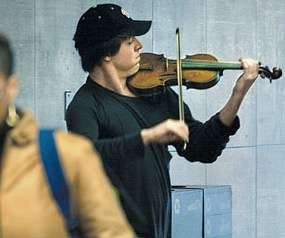 To a psychologist or neuroscientist the finding that most people walked by Joshua Bell is a trivial point. We know about “inattention blindness”. Consider the famous “invisible gorilla” experiment, or a wide variety of similar demonstrations. When people focus on one thing they pay little attention to peripheral events. The canonical example is the “invisible gorilla” experiment by Christopher Cabris and Daniel Simons. Cabris and Simons had subjects watch a video of a group passing a basketball around. Subjects were instructed to count the passes from players wearing white. During the video a man dressed as a Gorilla walks slowly across. Fifty percent of the subjects did not notice the Gorilla. In brief, the Joshua Bell experiment is rather low on the scale of remarkable inattention blindness studies. Gene Weingarten’s genius is that he assumed the “inattention blindess” result, and did not dwell on it long. Should we really stop and smell the roses? (or listen to Joshua Bell, or see the gorilla?) Yes, when its rose-smelling time. But our brains are not built for rose-smelling distractions. We are serial operators. We have a process called ‘selective attention’ which has its strengths and weaknesses. If we stopped and explored every weird noise in the subway station, just in case it happened to be Joshua Bell, we’d miss train after train. What is great about the Weingarten piece is that the focus was not condescending. It was not on the inattention of commuters, or the poor taste of the hoi polloi, or the snobbery of classical music. The focus was on the individual stories of those who did stop. These were widely varied and provocative. I wanted to know more about each of them. This was not a condescending view of office workers, but a thoughtful examination of what makes people tick and of what makes art. I could go on. Perhaps later. But I’m interested in readers’ perceptions and reactions. * A little googling revealed. 1. Gene Weingarten is a very highly respected syndicated columnist for the Washington Post. 2. Weingarten got the 2008 Pulitzer Prize for this feature “Pearls before Breakfast”. 3. This piece is the title entry in the anthology of Weingartens writing, “The Fiddler in the Subway”. This entry was posted in Art, Psychology by jkubie. Bookmark the permalink.